PLDT opens newest Startup Studio series in Cebu, invites developers for tourism solutions. Got the next big thing that will shake up tourism and travel? Here’s the chance to showcase your startup’s trailblazing idea. Leading telecoms and digital services provider PLDT, through its ICT research and development department Innolab, has partnered with IdeaSpace Foundation in inviting participants to the latest series in the Startup Studio search for the next digital solution slated to enhance the travel experience of domestic and foreign travelers alike. To be organized in November in Cebu, the program, dubbed as “A Travel to Disrupt,” challenges local startups to pitch in their tourism-centric enterprise solutions that can change and enhance the tourism industry in the country. “Filipinos are very savvy when it comes to developing digital solutions that are feasible to offer in the market, they just need the right support, training, and resources that can help them put it all together in today’s market,” said PLDT VP and Head of ICT R&D Joey Limjap. 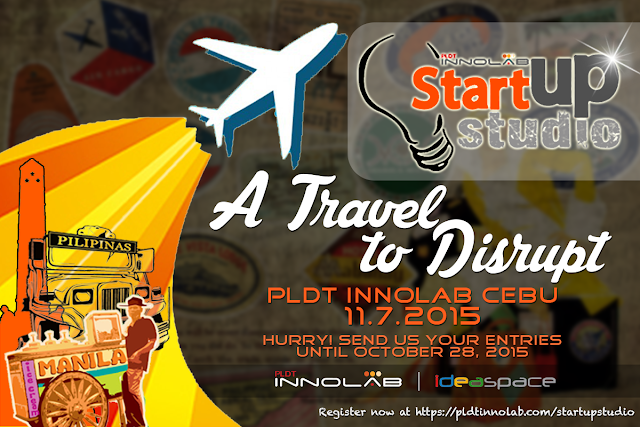 Interested applicants may register and submit their entries at https://pldtinnolab.com/startupstudio until October 28. Shortlisted applicants will be announced on November 2, 2015. For further queries, please contact Dara Ever Juan at InnolabEvents@pldt.com.ph. PLDT Innolab is the innovation laboratory of PLDT and serves as a testing ground for new products and services; a facility for technical skills training; and a laboratory where real world customer problems are dealt with daily.